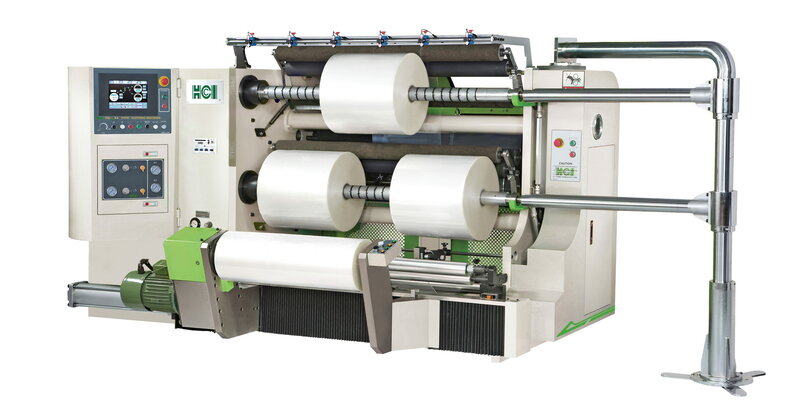 Slitter Rewinder Practical(FSL-KA) - HCI Converting Equipment Co., Ltd.
HCI Newly develop Slitter Rewinder, the FSL-KA Series Slitter Rewinder is designed for slitting a wide variety of materials such as, cellophane, PET, OPP, CPP, PE, PVC, paper rolls, and printed materials. This compact design occupies minimal floor space. Unwind and rewind is designed in same side providing the most convenient operation. Enlarge the roll capacity: unwind diameter can reach to 800mm; rewind diameter can reach to 500mm. Reducing the loading frequency and expanding the applied ranges. Equipped with pneumatic chuck for clamp the parent roll efficiently and easy. Quick change for different size of chucks. Equipped with web adjustment roller. It can reduce the wrinkle that cause by the low parent roll quality. 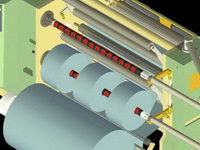 Three individual motors: One motor drives upper rewind shaft, one drives lower rewind shaft and the third motor is connected to the main drive roller. 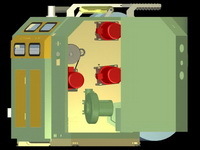 The operator can set the tension and material thickness for each rewind shaft separately. The winding direction of rewind shaft can be changed in any time and upper and lower shaft can run different direction also. 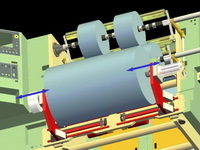 The unwind tension is sensed by load cell and compared to the set tension. 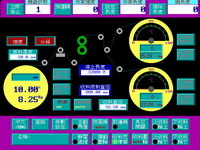 The microcomputer control system will increases or decreases tension according to the calculated the tension difference automatically. It can maintain the stable tension output during whole operation. Tension isolation point through pneumatic nip rubber roller, giving perfect tension isolation between unwind and rewind. It also ensures no slippage or scratches. Shear knives and razor blades are able to work independently or simultaneously. Due to compact machine design the change of slitting method is easily achieved. Segmented groove roller can insert to the lower knife shaft directly. It is possible to change groove roller without removal any shaft. Upper knife shaft tracks designed for quick install of male knives. Equipped with protecting cover for slitting section, prevent personal injured. Equipped with trim reject fan. 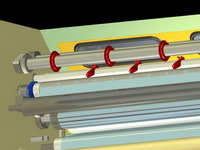 Specially designed ejectors with powerful ventilators remove the slit edge of web. It discharges electrostatic charge while plastic film is being slit and rewound. 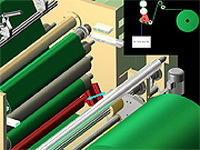 Automatic calculation control for rewinding employs HCI's self-developed precision friction rewinding ring, combined with automatic side-pressure tension compensation. 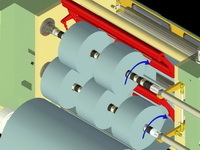 Two independent rewinding motors. 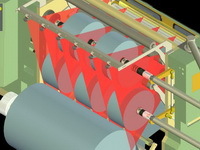 Rewinding tension is controlled by a fully-automatic air control system. An intelligent rewinding diameter control system assures extremely stable rewinding tension without the need to adjust the tension according to speed and diameter variables. Set the setting tension according to the initial condition, and then the entire tension - from initiation to finalization - is automatically controlled by memory and feedback. Adopted with 2 sets of pneumatic lay-on rollers for build the good slit roll structure. Equipped with products discharge device: helps heavy rolls unloading as well as efficiency during slit roll exchange. Adopted with industrial micro computer providing the accurate and stable control. Dialogue parameter setting environment for fast start. Adopted with two rewind tension control programs: Rewind Torque mode & Rewind Speed mode. Rewind tension auto increase function. 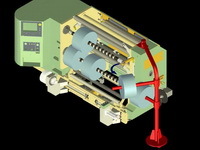 Upper and lower rewind shaft different winding direction function. Unwind auto stop and material brake stop function. Parameters memory function: included material thickness, initial diameter, tension and so on. Unwind Core Inner Diameter [mm] 76 / 3" or 152 / 6"